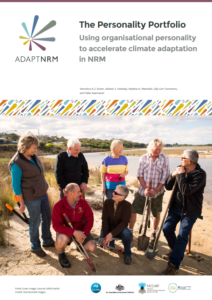 Updated versions of AdaptNRM resources can be downloaded from this page. 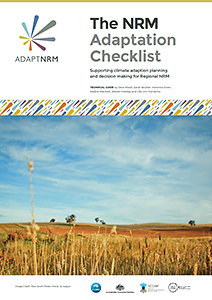 Visit regularly, as we continue to release tools for NRM adaptation planning. Further information about these resources can also be found on the Frequently Asked Questions page. Need a short version to share? 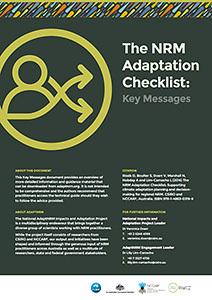 Download The NRM Adaptation Checklist: Key messages (PDF). The Key Messages document has been designed as a quick reference for a range of stakeholders. Need a short version to share? 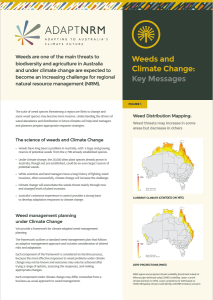 Download Weeds and Climate Change: Key Messages (PDF). The Key Messages document has been designed as a quick reference for a range of stakeholders. Scott, J.K., Webber, B.L., Murphy, H., Ota, N., Kriticos, D.J. and Loechel, B. 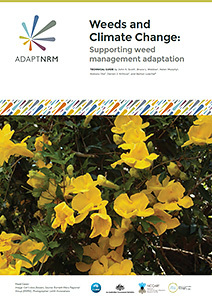 (2014) AdaptNRM Weeds and climate change: supporting weed management adaptation. For a high resolution version of the guide (26MB), follow instructions for download through the CSIRO Data Access Portal. Need a short version to share? 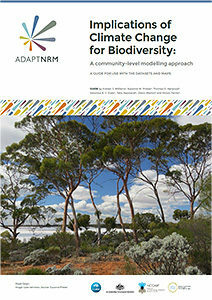 Download Biodiversity and Climate Change: Key Messages (PDF). 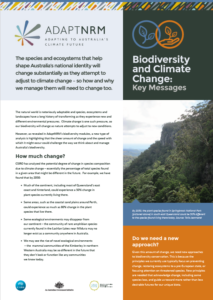 This document highlights the key messages from the Implications for Biodiversity and Helping Biodiversity Adapt modules and has been designed as a quick reference for a range of stakeholders. Download The Personality Portfolio (PDF). This document is a supplement to the Shared Learning Module. 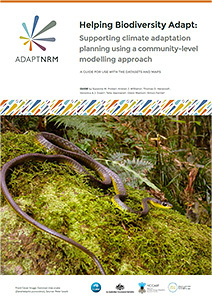 Download AdaptNRM Achievements and Outcomes (PDF). 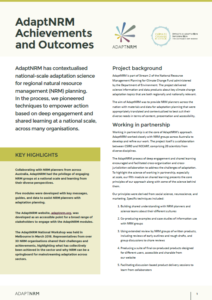 This document highlights the key achievements and outcomes from the AdaptNRM project.